Check out the new exclusive from Entertainment Earth. 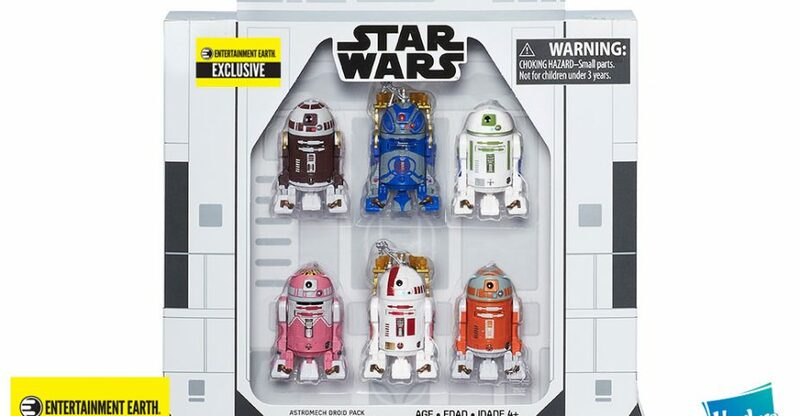 They will have a Star Wars Astromech Droids 3.75″ Scale Figure 6-Pack! Priced at $79.99, you get six Astromech Droids. The set is scheduled for a November release. Click the link below to order it. Among our most beloved exclusive action figure sets were two classic packages of droids, so on the 10th anniversary of their release we conspired with Hasbro to bring you even more robot action! Six awesome robots from Star Wars, Return of the Jedi, and The Clone Wars are scaled to go with your favorite 3 3/4-inch action figures, and they sport the kind of articulation you loved in Hasbro’s The Vintage Collection action figures. These figures come packaged in an out-of-this-world R2-D2 shaped box straight out of the droid foundries of Industrial Automaton. You’re going to love it so much you’ll want a second set to display in the box! Both Jabba’s bartender and RC-C2 include a drink dispenser, drink tray harness, and seven glasses for your alien figures! All six robots boast fantastic rolling wheels!